This wide board solid walnut wood flooring has a beautiful deep chocolate brown colour that is pre-finished with a hard wearing satin lacquer. Our walnut flooring is manufactured with tongue and grooves on all 4 edges, allowing for fast easy fitting with reduced installation wastage. 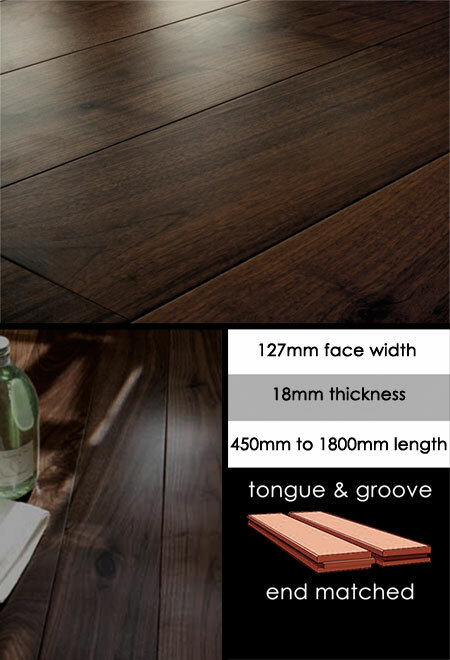 All Walnut timber flooring is kiln dried and supplied in cardboard packs. 127mm x random lengths to 1800mm. * Kiln dried Walnut flooring. * Quick & clean installation. * T & G on all sides.